A serious time saver! 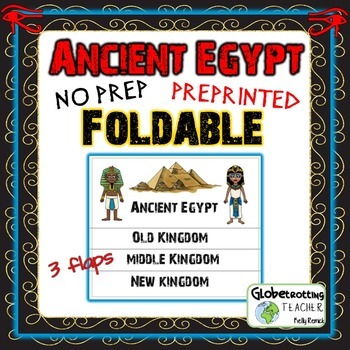 This print and go, 2-page, flip-book foldable is perfect for organizing and reinforcing the main ideas associated with Egypt’s 3 Kingdoms. 4 titles are pre-printed and the inside includes key points for students to write about. Dotted lines show you exactly where to fold. No more messy, illegible, misaligned foldables. There is plenty of room on the upper flaps for students to illustrate something, or perhaps to add important vocabulary or additional notes. 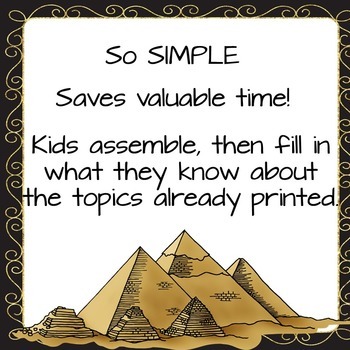 Kids love this creative and kinesthetic approach to learning new information. 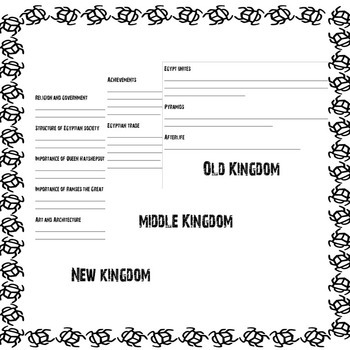 This foldable is great for interactive notebooks, daily work, note-taking, homework, or used as an alternative assessment. 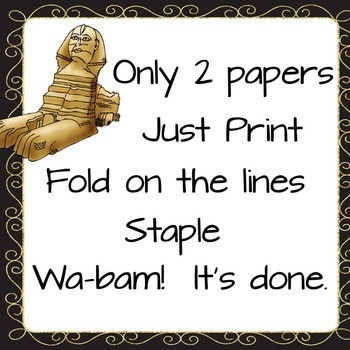 Simply print, align the papers, fold on the dotted lines and staple the top. All directions are included for printing and assembling and images show you exactly how to do it. Thank you for selecting this activity. ***Just go to your My Purchases page (you may need to login) and beside each purchase you'll see a Provide Feedback button. Simply click it and then give a quick rating and a short comment. Each time you give feedback, TPT gives you feedback credits that you use to lower the cost of your future purchases. Those few seconds give you a discount. Be the first to know about my freebies, discounts, and product launches: Look for the green star next to my store logo and click it to become a follower. Voila! You will now receive updates as soon as they happen.